Publishing Perspectives state that the top 60 global publishers with annual revenues of approximately $70 billion spend 4.5 percent of their revenues on innovation technology. Instead of allocating more budget towards innovation, the majority of IT spending is actually allocated to legacy solutions which represent between 60% and 75%. Unfortunately, there seems to be a disparity between innovation spending and legacy solutions’ spending. Because publishers spend more money on legacy systems, they impair themselves from taking the necessary steps to developing AI for the future. If they don’t adopt AI quickly, they will fall behind the other industries which are already implementing AI. 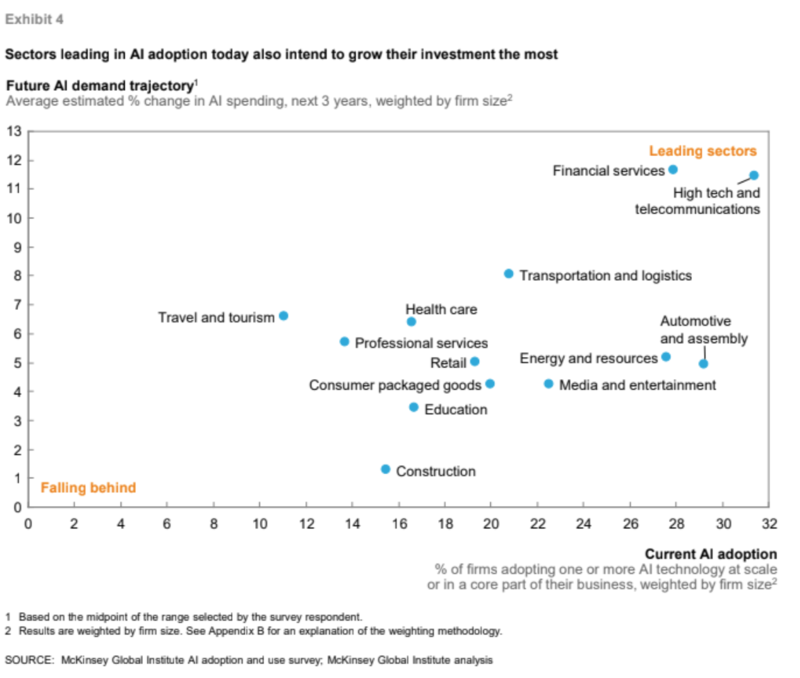 Looking at the graph below from McKinsey, we can already see the education industry (as a whole) is lower on the scale in terms of AI adoption and future of AI demand trajectory. Derived from our research at EDIA, in which we surveyed a number of education professionals about their perception of AI 46% of our respondents reported that cost is a challenge for implementing AI. We’ve also found that 64% of our participants don’t know about or don't have a clear understanding of their budget for AI. However, out of the 35% that do know their budget, 50% have only up to a meager €10,000 to spend on AI; 40% only have up to €100,000. Only 10% have a budget above €100,000. A McKinsey report found that AI does have high returns on investment only if a company is willing to go ‘all-in’ and stay committed long-term. In general, their research found that current AI adopters with proactive strategies report profit margins that are anywhere from 3-15 percentage points higher than their competitors. They also note that these profit margins are likely to increase in the coming years as AI improves and becomes more accurate. McKinsey also highlighted Netflix as one example of a company that successfully adopted AI. Netflix discovered that their customers felt overwhelmed by the number of choices they had for their viewing experiences, and the company introduced AI to solve the problem. Therefore, Netflix launched a personalized recommendations feature which groups similar types of shows using AI. Now, when a Netflix customer opens the platform, the interface presents them with content that is most relevant to the content they have viewed in the past. Netflix estimates that this AI saves the company roughly $1 billion (USD) every year in lost subscription fees. What if my organization doesn’t have a huge budget like Netflix? If your organization doesn’t have a large budget like Netflix, then you could allocate a modest budget into agile and iterative AI development projects. For example, organizations that don’t want to risk too much money into AI can look into a proof-of-concept project with an investment of €10,000. Therefore, the proof-of-concept will set the bar for AI development for the future instead of delaying it further down the road. Another option is to look into solutions that resolve one problem at a time. Instead of looking at all problems as a whole, like smart content, adaptive learning, learning analytics, automated grading, and so forth, organizations should adopt a more agile perspective and seek one solution, then move to the next. Adopting one solution, for example, meta-tagging data for smart content is a relatively fast process, and results can be seen in as little as 3-4 weeks depending on the type of content and metadata needed. By taking the first step and beginning AI adoption, organizations are setting themselves up to be prepared for the AI future. So how much does AI cost then? If we were to look only at one specific application of AI - automation of content metadata tagging - we would start by reviewing the cost of manual metadata tagging. It typically costs around €2,5 to €5 per content item. At EDIA, we charge €0,5 per call for the lowest transaction volumes. You can see that this provides a clear business case for implementing content metadata tagging. Ready for AI, but not sure how to get started? Take a look at how our client, Malmberg, used 360AI to start their AI journey by accurately meta-tagging their educational content.